Experience better suspension articulation. Ultimate durability in off-road conditions. Stock rubber bushings can tear out, and tend to crack over time. 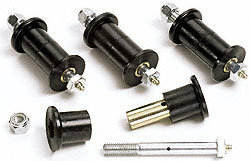 Poly bushings replace stock rubber units. They include steel sleeves and rifle-drilled greasable shackle bolts. Choose from either Red or Black.